20.73 Grams, .868 Silver. Mintage: 5,210,000. “Standard Catalog of World Coins” (1801-1900) by Krause-Mishler. C#130. “Russian Coins” by V. L. Yanin. #1406. Obverse: Cyrillic • 1813. П C below eagle is for the mint officials. This die was about to come apart. It has multiple serious die cracks. Through the A – star – and P near the top, from the rim through the entire date, from the rim to the left wing about 10 o’clock and in the right field above the orb. 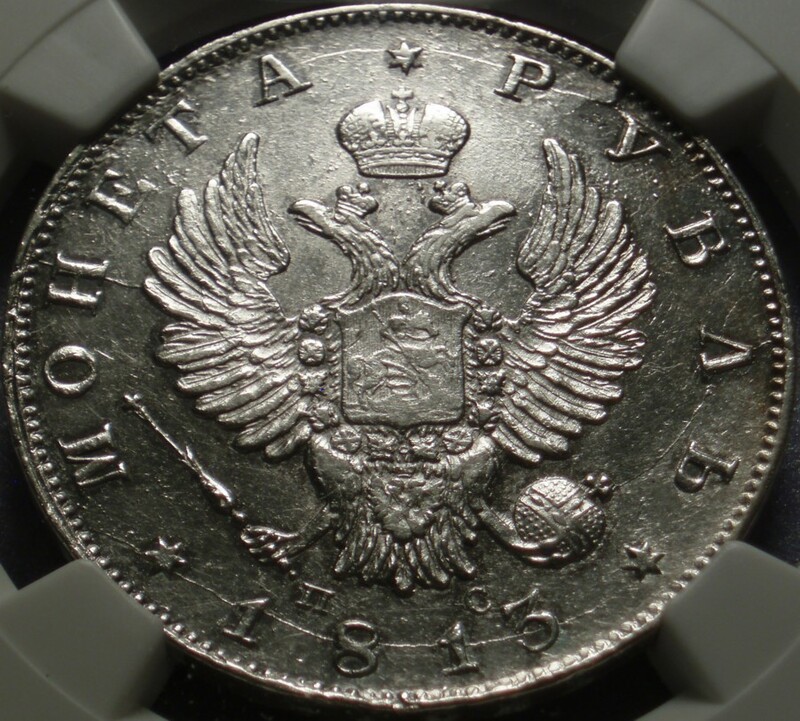 Reverse: Cyrillic • C. П. Б. is the St. Petersburg mint mark. • Crown and wreath. 1813 “One Rouble” from the “Empire” of Russia. It has been certified genuine and graded Almost Uncirculated 58 by the prestigious third party grading service, “Numismatic Guaranty Corporation” (NGC). Napoleon Bonaparte and his “Grand Armée” of 690,000 men had invaded Russia in 1812 and burned Moscow. Then came his famous retreat. Only 93,000 returned. In 1813 the Russians were still hunting Frenchmen. The Coin: A condition scarcity, it saw a very few hands before it got put away. At AU58 it is probably nicer in hand than coins graded 60, 61 and even 62. Not many of these survived all the intervening melting pots. Fully original and genuine, a very nice piece overall. Even though it has been professionally graded, that is just an opinion and grading is subjective, so please see the pictures and judge for yourself.